I've finally drawn out the composition onto the canvas paper, and I'm ready to paint... at last, the fun bit! It's taken me longer than I had anticipated, due to it's size (50.3 x 42cm- plus bleed!) 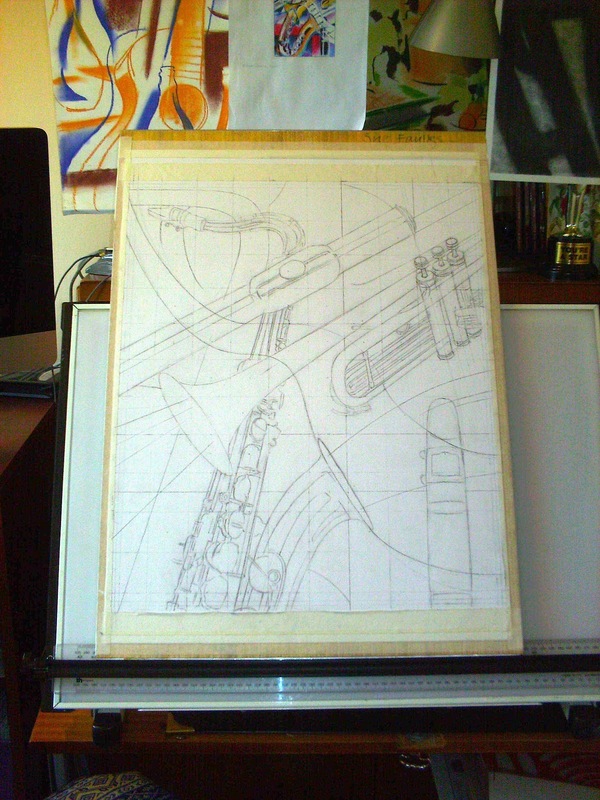 and complexity (musical instruments are really tricky to draw- thank you 'Grid Method'). It's now Thursday... will I get it done in time? I need to as the client is wanting to give it to her sweet- heart on Monday- Valentine's Day! I've often had tight deadlines... but this one is pushing it slightly! I'll up load the painting in it's various stages (this is fun, as it's the first time I've recorded my work in this way!). p.s Hope it doesn't disappoint!